On this new years day I received a copy of Sindhishaan, which highlights the various historical and cultural aspects of the Sindhi Community. I feel happy to say that I am doubly blessed on this New Year day! I know, you will need to have my book Dictionary of Sindhi Literature (which I am sending to you by a separate Regd. 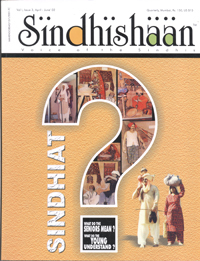 Book Post) for consulting its various entries on the Sindhi authors, works, events and terms.